I just came back from an Alaskan cruise where I paid up and bunked on the top floor. For these "special" guests, they offered a private courtyard, private fitness center, private showers and steam rooms, 24-hour butler service – the works. The room was smaller than the pictures, but the cruise was good. The conversation, however, was excellent – and for us, very fruitful. You see, I was able to connect with several foreign business owners and chief executives, and even a fellow trader who happened to be aboard ship. Naturally, the talk turned quickly to Greece and China. The overwhelming consensus among us was that things in Europe would get worse before they got better. The United States has its own debt problems, of course. But for the time being, the Fed can print its way out of trouble – interest rates are likely to stay low for now. And investors see the U.S. as a safe destination in the "flight to quality" that happens at times like these. Rather, the next debt crises are likely to come from some of the Eurozone's "Southern Tier" economies: Portugal and Italy. You see, the European Central Bank is going to keep printing euros to bail out the countries that wined and dined, but skipped out on the bill. That's why savvy investors are betting on parity between the dollar and the euro by the end of the summer. 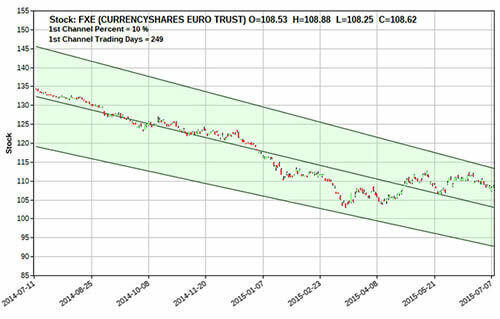 This chart is a 1-year daily showing the 30% downward slope of the Guggenheim CurrencyShares Euro Trust (NYSE Arca: FXE). This fund tracks the performance of the euro, and it's 30% weaker than it was a year ago. Clearly, if this trend continues, we can reasonably expect to see the fund touch 100 in the next month or so. 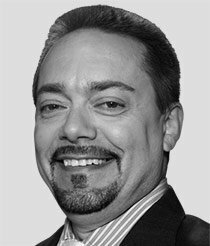 I just question why Tom doesn't consider the premium preice when calcualing profits? If I paid 3.00 for $110 Put ten the price needs to be below 107 for me to start making money. I am basically even at 107. WHy isn't that considered? It's understood when calculating options profits, you first subtract the premium. Although that may not be obvious from the article, it is implied. He is telling us that if FXE falls to $100, we will be able to sell the position for 300% of the premium outlay, he does not imply a 300% profit. Can we have a update option for 2017 just for the few days before labor day and then days after. Just starting option and would like to make it work, I understand what you are commenting about. But want to not confuse anything. Please send a email response to me Tom Gentile or whoever check from office. Or it was one on Apron I sent message about never received response, I would like to put that in to make something. That was put up by Shai. May have been stupid questions to you that have expertise in it but I was asking to be sure about option before doing, I am just starting,trying to get in one.